An Anglican priest known as the “vicar of Baghdad” for his work in war-torn Iraq has recounted atrocities inflicted on Christian children by ISIS, the Muslim jihadist army that has declared the creation of an Islamic caliphate in parts of Iraq and Syria. “They chopped all their heads off,” Andrew White told the Christian Broadcasting Network in an interview. In an interview in Jerusalem, where he was ordered to travel because of threats by ISIS fighters, he told of Iraqi Christian children ordered to convert to Islam or die. “They chopped all their heads off,” White said. “That is what we [Christians in Iraq] have been going through. That is what we are going through,” he said. While White, in the report, doesn’t provide a time or location, or whether he personally witnessed the atrocity, he said the same tactic had been used against adults. “[Islamic jihadists] say to one man, an adult, ‘You say the words of conversion or we will kill all of your children.’ He was desperate. He said the words. Then he phoned me and said, ‘[Father], I said the words, does that mean Yasua doesn’t love me anymore? I have always loved Yasua. I said those words because I couldn’t see my children be killed.’ I said, ‘Jesus still loves you. He will always love you,’” White recalled. He said that while Iraq had 1.5 million Christians, only a handful remain. The largest Iraqi Christian community in the world now is in Chicago, he noted. While reports on beheadings of adults, wholesale slaughter and torture with punishments such as crucifixion are common when ISIS is involved, WND has reported atrocities against children. That report also cited an emotional White. “I’m almost in tears because I’ve just had somebody in my room whose little child was cut in half,” he said. “I baptized his child in my church in Baghdad. This little boy, they named him after me – he was called Andrew,” he said at the time. The report said it happened in the Christian village of Qaraqosh after Kurdish forces left and ISIS fighters arrived. He cautioned, nevertheless, that news agencies and readers always should be a little skeptical of random images posted online, because there’s likely an element of propaganda in such disputes. Some of the recent images appeared to have been been staged, he said. But others appeared genuine. The Anglican report quoted Archbishop of Canterbury Justin Welby. “The horrific events in Iraq rightly call our attention and sorrow yet again. Christians and other religious minorities are being killed and face terrible suffering,” he said. “Several images have emerged of Christian children beheaded by ISIS, merely for being Christian,” the report said. 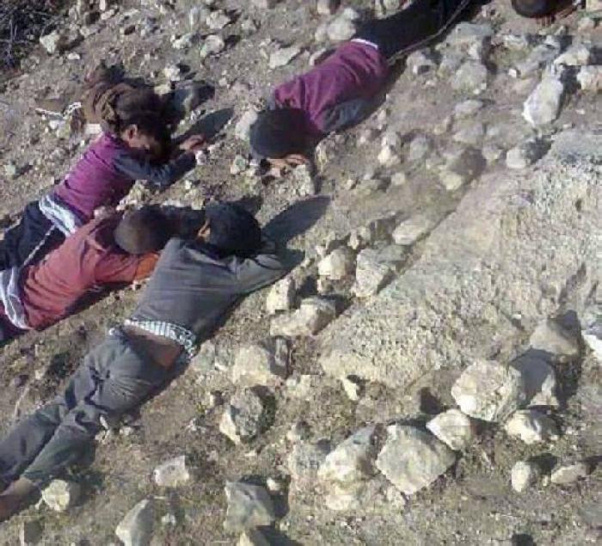 The images show children lying in rocky fields where they died, a woman whose throat was cut and the decapitated bodies of children. 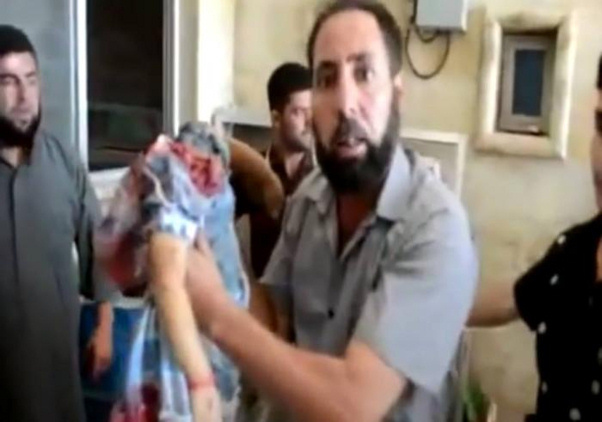 WARNING: Following are extremely graphic images, purportedly of atrocities against children by jihadist fighters. Please exercise extreme caution. WND columnist Les Kinsolving has noted the beheadings of captured Western adults and has suggested a solution. “What would surely seem more effective … would be an Obama announcement that he had ordered Navy SEALs and Army Special Forces to engage in campaigns of mass capture of ISIS and other Muslim murderers of our troops. Then, with massive capture, an order could be given to execute five to 10 of these Muslim killers for every one of American forces and allies who are beheaded,” he wrote. WND columnist Jerry Newcombe joined the conversation, writing: “I saw a photograph that makes me sick. 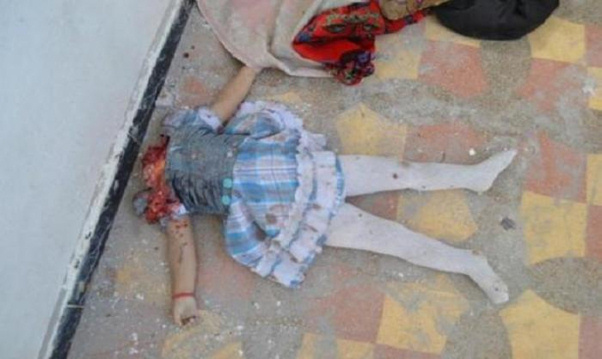 It is the corpse of a little girl, about 10 years old, wearing a dress and tights. She lies sprawled on the floor with her arms outstretched. For a presumably poor girl, she looks like she’s dressed in her Sunday best.